A lawn, is an indispensable setting for the home. Even with care and proper feeding, just like humans, troubles do show up, especially in the form of a grass fungus or other lawn diseases. Homeowners are probably not too aware of grass diseases. We have not learned to spot them, and generally we attribute such ailments to drought, hot weather, not enough fertilizer, heavy usage, poor soil or some other tangible condition. In spite of the tremendous recuperative powers of a good lawn, do not be too complacent. Turf diseases are always a threat if proper season, humidity, host and stage of grass growth combine. Fortunately, know-how and chemical help are available to make the job easier. 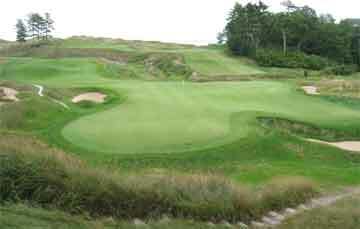 Undoubtedly, golf course superintendents know turf grasses best. For decades they have been treating their greens for a variety of diseases, most of which may also attack home lawns. There are brown-patch and dollar-spot, melting-out and leaf-spot and several others. An authoritative technical book on grass diseases lists dozens of different disease pests attacking one of the tougher lawn grasses. Though not present all at once in every lawn, the invisible spores which spread these diseases are carried by the slightest breeze or on the sole of a shoe and are always “available”. Since we cannot stop the infiltration of a spore, the best offense is preventive treatment and maintaining vigor. A healthy lawn is the result of intelligent care. Ample fertilizing is basic at the proper season (especially autumn and early spring). Mowing high during dry weather – two inches for our northern stalwart, Bluegrass – but somewhat lower for Bermuda or most southern grass is equally vital. Thorough lawn watering at intervals during drought and eliminating weeds are also called for. Obviously, a strong turf is not as apt to suffer from diseases as would a weak one. On a strong turf, diseases may not even be noticeable, until compared to an adjoining lawn that has received preventive treatment. In the past the most common chemical family everywhere recognized for treatment of turf diseases consisted of mercury compounds. These, have been used against grass ailments almost since Pasteur formally recognized bacteria many years ago. Sulfurs and copper derivatives have been used to treat lawn afflictions. Yet no better results have been obtained than with the universally popular mercurials. The golf course superintendent customarily applies chemical applications several times per year for maintenance. Whenever brown-patch or dollar-spot seriously threatens, applications should be made oftener perhaps once per week. The home lawn seldom rates so intensive a program, yet as little as a single application judiciously applied during the cool, moist, leaf-spot weather of middle spring is beneficial. Often just one or two treatments show up in greener, thicker turf, less disease-ridden than nearby untreated areas. It stands to reason that with the longer growing season in the south, disease control is even more important in zoysia, St. Augustine and centipede grass country. Here’s a lists of five diseases frequently troublesome on bluegrass. Additional ones occur on bent-grass and other lawn grasses, but these should suffice to illustrate typical turf disease. The five diseases listed point up a rather neglected facet of home lawn care. Just as the “ice box” or auto of yesteryear gives way to modern design and improvement, so has the average lawn graduated from a weedy volunteer to a managed community of selected plants. Mowing and lawn care has been streamlined with the advent of self-propelled and zero-turn mowers, underground sprinkler system, weed eaters, while feeding and weeding have been made easy by up-to-date products. Any home-owner today has a choice of the best lawn species, readily available as clean packaged seed under reliable, national brands. It would seem that the good lawns resulting are now ready for more subtle refinements. Perhaps foremost on the list is checking disease. With products and sprays now on the shelves in almost any garden center or hardware, a modern healthy lawn is in the realm of every homeowner.